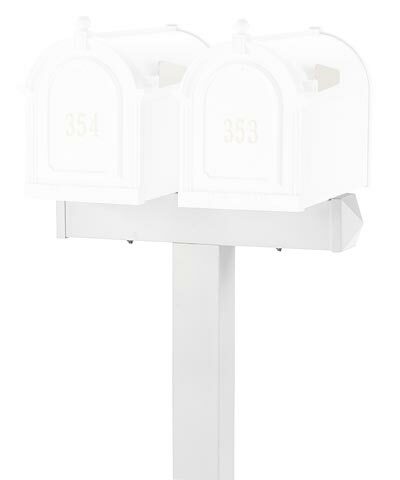 Provide a striking support and bright look to two existing mailboxes with this Whitehall White Dual Mailboxes Post. This classic and sturdy unit adds curb appeal to your home, thanks to its crisp, white color and generous height. Slide the 74" tall, aluminum sleeve over a wooden 4 x 4 post (not included), and install it deeply into soil for a lasting accent. The 23.75" long, horizontal support bar attaches to the top of this post, and its two pyramidal ends complete the piece. This unit handily accommodates two Whitehall White Deluxe Mailboxes (not included), allowing you and your neighbor to stylishly receive mail. For even more individuality, add a custom topper, side panel, or door panel to each mailbox. The white tone of this post and support bar offers a classic look to the edge of your lawn, and the aluminum construction ensures durability. Showcase two existing mailboxes with ease using this White Dual Mailboxes Post. Assembly required. Note: This description refers only to the Whitehall White Dual Mailboxes Post. The mailboxes shown are not included.